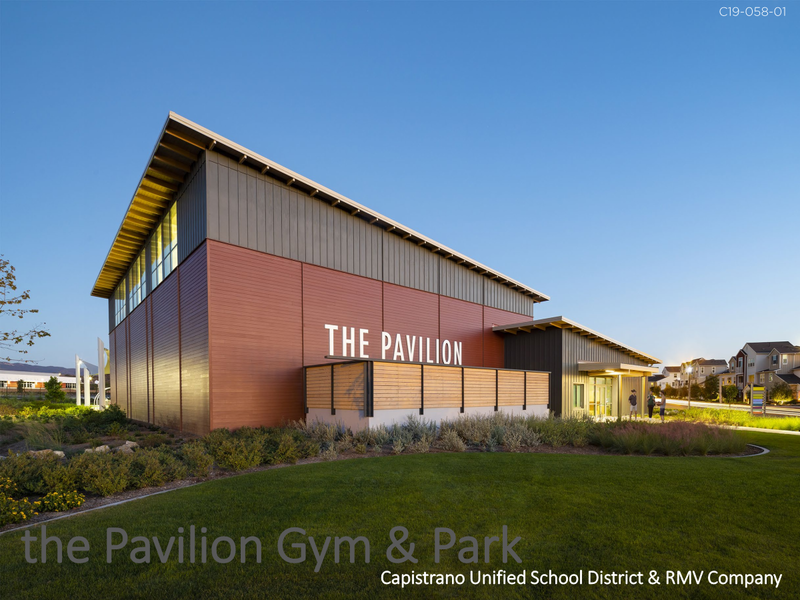 This 11,960-sq.-ft. Pavilion and park is a joint-use facility with the Rancho Mission Viejo Company and the Capistrano Unified School District. Built as an amenity for the residential community, the Pavilion offers a large space for basketball, volleyball and other activities with built-in seating for spectators. During the day, it will serve the adjacent K-8 School, and in the morning, evenings and weekends it will used by the community. The six acre park features soccer, softball and tot-lot play area. A picnic area and passive open space provide shaded gathering areas for the adjacent neighborhood. This project is a great example of how residential developments and school districts can work together to meet the needs of both interested parties and really maximize the use of such an amenity to the community at large. The Rancho Mission Viejo Company hosted an 8-month long programming and schematic design process to co-author a Joint-use Pavilion and park with the Capistrano Unified School District and the K-8 school architect to create a cohesive vision for their village of Esencia. On the design end, the project betters Title 24 requirements by 17%, including low flow fixtures that are 35% better than the baseline requirement and uses reclaimed water for irrigation with native and drought tolerant planting. Initially the design was presented to the CUSD school board. There were also weekly coordination meetings to review programming, scope and joint-use requirements between the Rancho Mission Viejo Company and the School District. RMV worked closely with CUSD to develop an agreement for use of the facilities and components within the facility. A dedicated District storage room has been provided off the gym space. District speakers and PA system have been included to coordinate with school announcements and paging requirements. Adjustable height basketball backstops for use by younger students. Bleachers are sized to fit approx. 350 students and total Gym capacity is 1,373 to fit the student body of the school. Tot lot is exclusively community use and single use occupancy toilets accessed from the exterior have been provided for community use throughout the day so as not to mix with the student use of the main building toilet rooms by the students. See information below and 3 additional photos. This 11,960-sq.-ft. Pavilion and park is a joint-use facility with the Rancho Mission Viejo Company and the Capistrano Unified School District. The large indoor space along with the outdoor six-acre park will serve the adjacent K-8 School, and in the morning, evenings and weekends will serve the community.